A hands-on, cell-free system to explore gene expression. 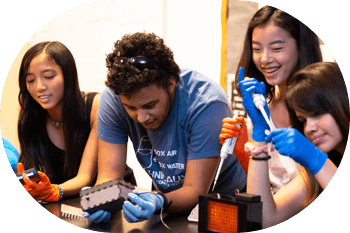 BioBits™ were developed by a group of synthetic biologists to help students learn biology by doing biology. Traditionally, running molecular biology experiments outside of a lab has been difficult due to the expensive equipment and complexity of growing living organisms. BioBits take advantage of cutting-edge freeze-dried cell-free technology to make it possible to run biological experiments without living cells. Learn about DNA and how it makes proteins by making your own fluorescent proteins and more! BioBits are portable, user-friendly, and inexpensive, making it possible to do molecular biology outside of the lab. We believe in providing quality science education for everyone. Since molecular biology can be difficult to teach, we developed activities that are easy to implement in classrooms to teach about DNA, RNA, and proteins. 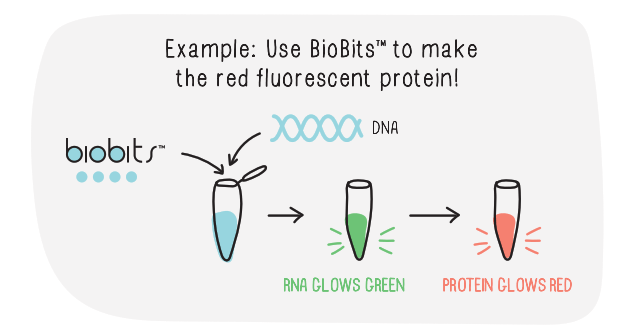 Instead of using live cells to turn DNA into proteins, BioBits uses a cell-free extract. That means we’ve pulled out all the essential cellular machinery out of the cells and combined them into BioBits reactions. No cells. No hassle. No special storage needed. BioBits incorporates cutting edge science and technology in your classroom. Want to learn more? Check out our video with interviews of BioBits founders, experimental demos, and more!